If you recycle bottles and tires, perhaps you should try to use them to build something. Some of the possibilities are quite surprising. Just ask Jan and Annie Warmke at Blue Rock Station south of Philo, where you can find their Earthship or “House of Trash” as some call it. 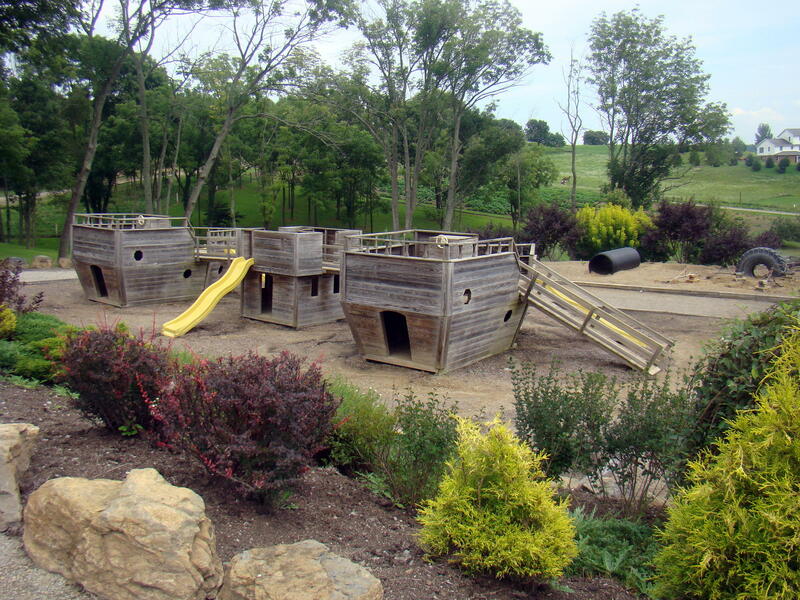 They had an intense passion to use whatever they could find to build their home in the country. All of their buildings are composed of recycled materials and pieces of nature. Annie, the Mother of Creativity, guides the tour of her dream come to fruition. She served as both creator and contractor of Blue Rock Station. 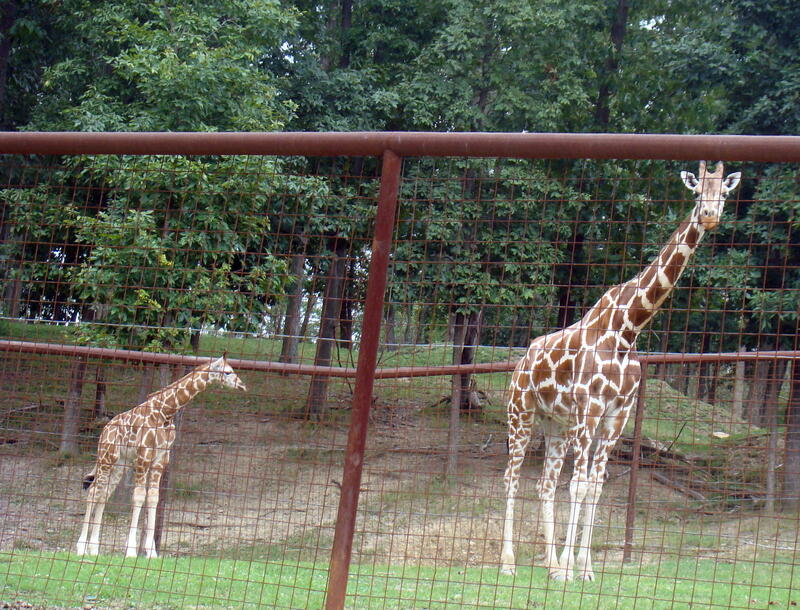 With the help of a few interns, mostly college students, projects are designed and completed during the summer months. 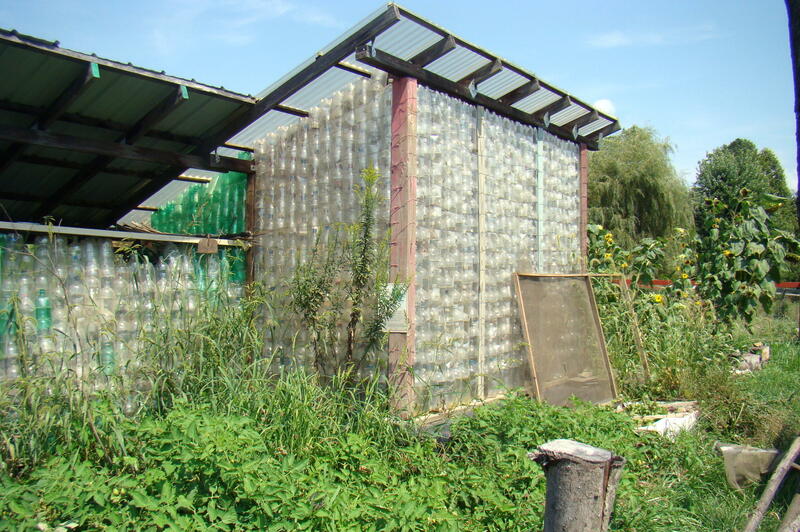 A greenhouse built of plastic two liter bottles provides a place to start plants and grow food throughout the year. Over one thousand plastic bottles used to construct it will never need replaced since they don’t decompose. 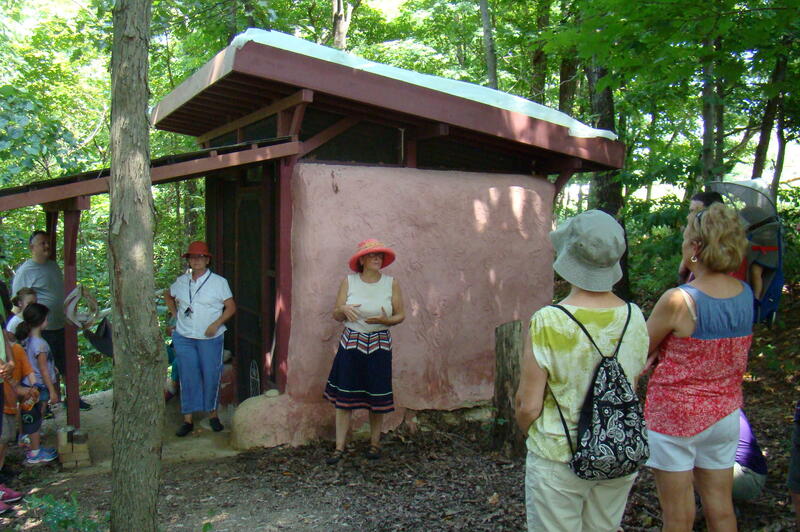 Annie, the owner and guide, is easily spotted wearing her pink hat. 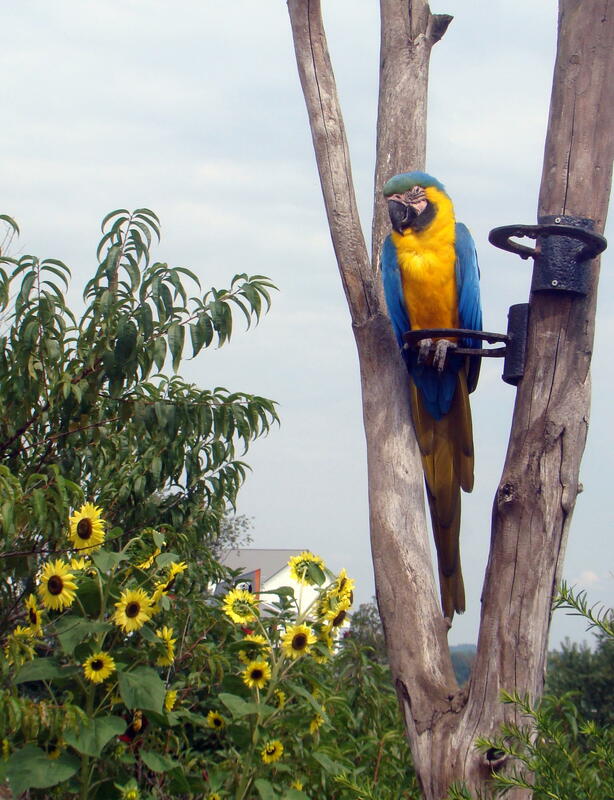 Cottages provide housing for overnight guests and/or interns. Made of bales of straw, they’re covered with “earth plaster”. 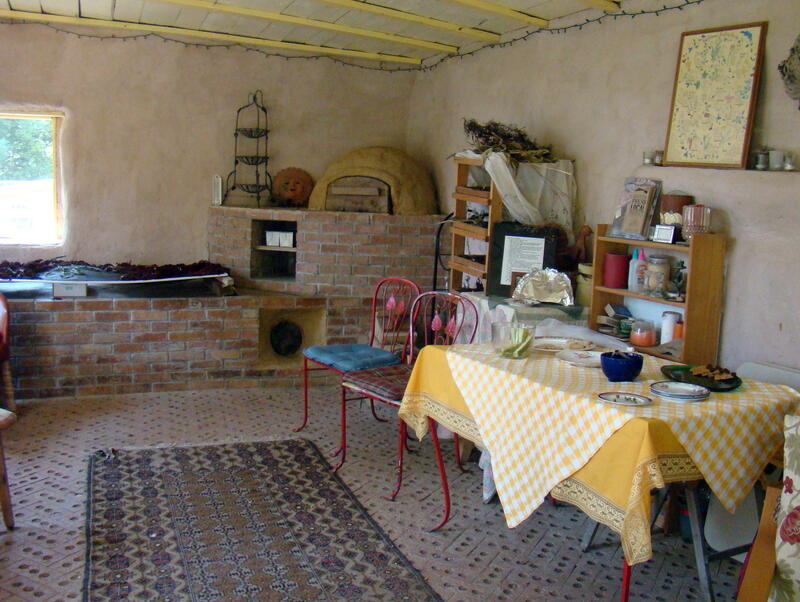 This adobe-like covering consists of mud, straw, milk, salt, flour and linseed oil – so it won’t crack. Pickle jars placed in the ceiling gather outdoor light. Bottle bottoms create beautiful window substitutes. An outdoor patio makes the perfect place to relax under the shade of the trees. 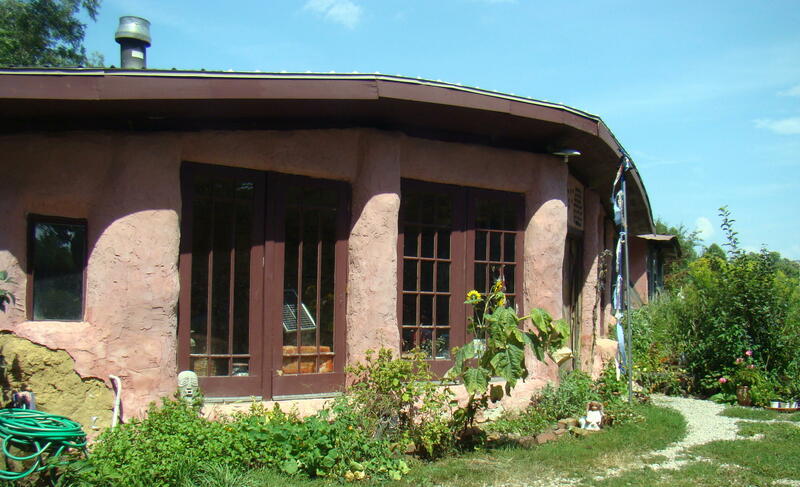 Nearby is one of two composting outdoor toilets, as well as the garden since both need to be in close proximity to the main house, Earthship. 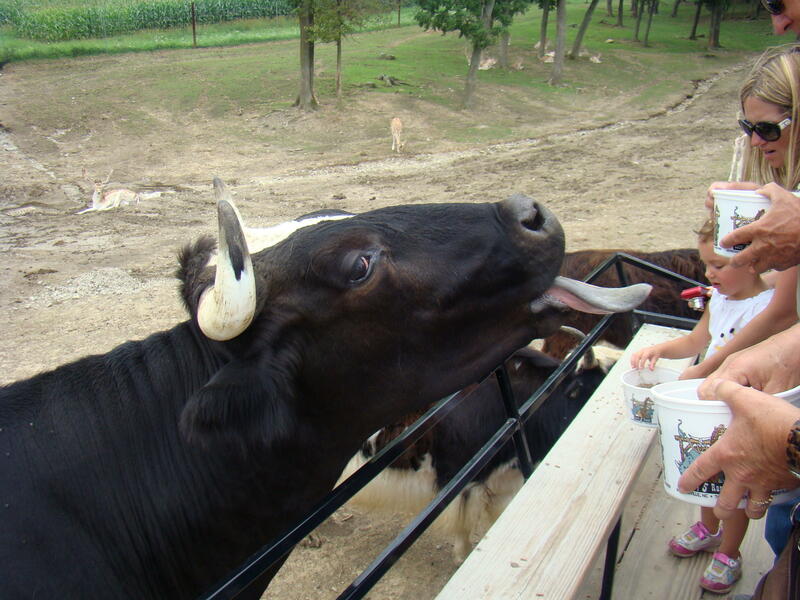 Needless to say, pesticides are not used. Annie has tea prepared for the group inside Earthship. A few mint leaves dropped in the ice tea make it extra refreshing on a very hot day. In addition, salted cucumber slices, cherry tomatoes, sandwiches and cookies complete the back to nature table setting. There Annie sits in a comfortable swing, while answering questions from the group. Tires, bottles, cans, plastic two liter bottles and milk jugs form the walls of the house. Then this core material is covered with earth plaster and a coat of lime paint to brighten it. With help from old barns being torn down and pressed tin for the ceiling, the house becomes a showplace. A unique brick oven in one corner contained guard rails, pipe and even metal rods from old campaign signs for the grill of the oven. On a cold winter day, Annie sometimes wraps in a blanket and curls up on the brick wall to relax, read, or nap. All roofs collect water into a cistern from which they get water for basic use, but not for drinking. Over the year they collect over 150,000 gallons of water from their rooftops. Something I know works from experience is a solar shower. Water, in a black plastic bag on the roof, gathers heat from the sun. A switch on the end of the bag opens the shower head and produces a nice warm, sometimes hot, shower. However, Annie wants to add a bathtub very soon. As experiments continue, new ideas come to the forefront that they perhaps wish they would have known about a few years back. Their newest project is solar energy installation. A solar panel with a wind turbine gathers energy in one place, while the house has a small solar panel. More will be installed shortly. 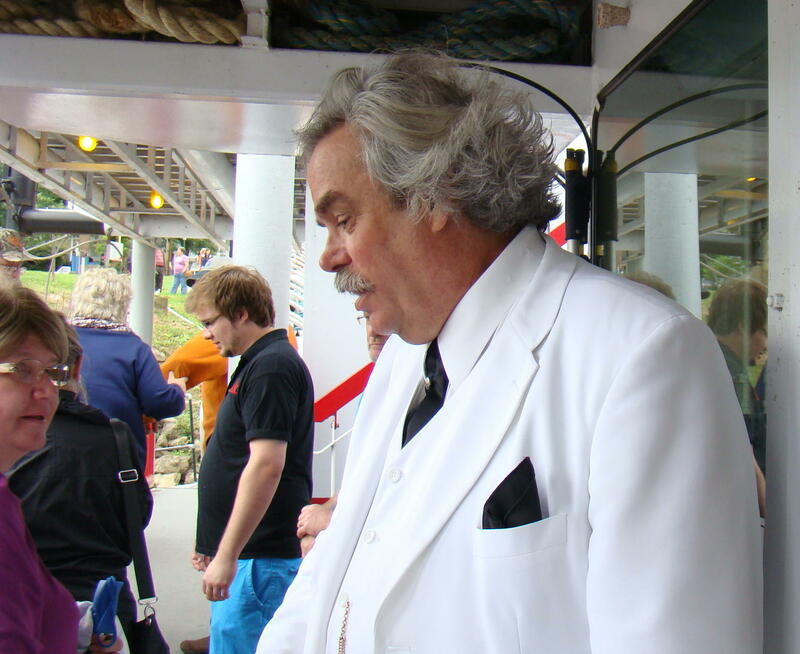 Reservations must be made in advance so either call 740-674-4300 or visit their website at http://www.bluerockstation.com. 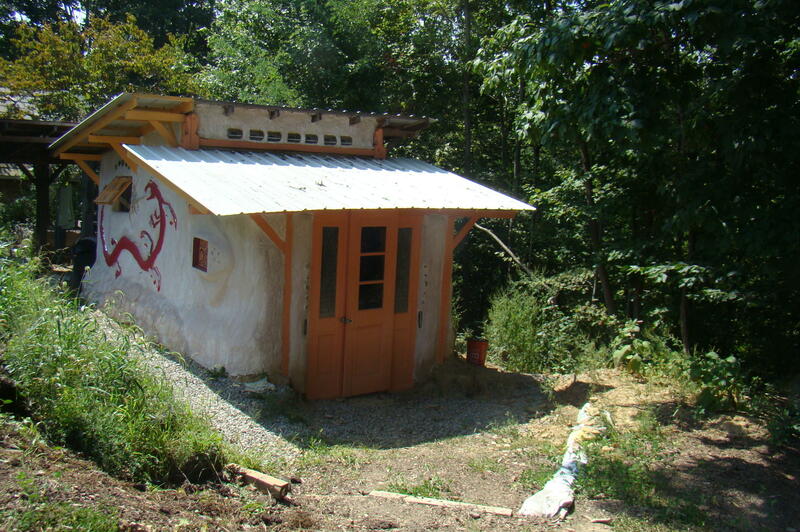 Take a drive along the Muskingum River and visit this unusual “House of Trash” or Earthship, as they feel more correctly describes it. Peace abounds at Blue Rock Station with only nice voices, open hearts, and inquiring minds desired. Perhaps it will inspire you to be more creative with your natural resources…and your trash. 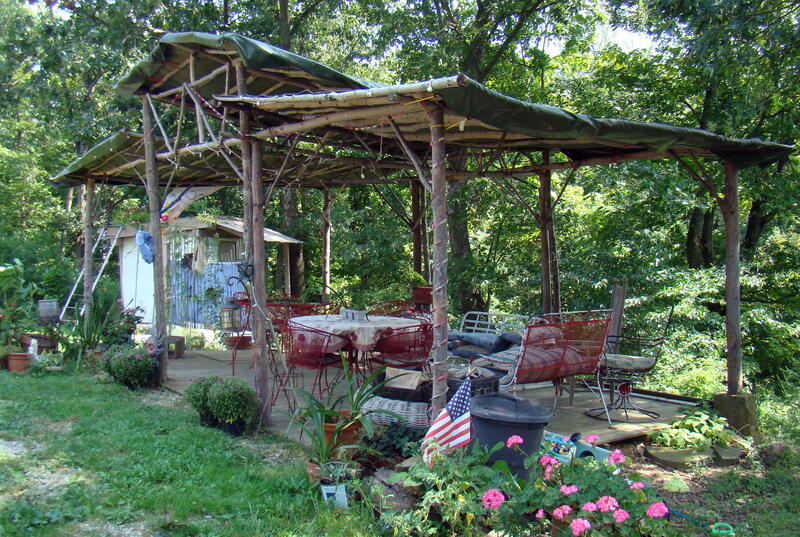 Earthship can easily be reached traveling along the Muskingum River on Route 60. Cross over the Muskingum River to the west on Route 66, North Street. At the stop sign turn left on Old River Road. In less than a mile you will come to a hill with a fork in the road. There is a Blue Rock Station sign pointing toward the right on Virginia Ridge Road. 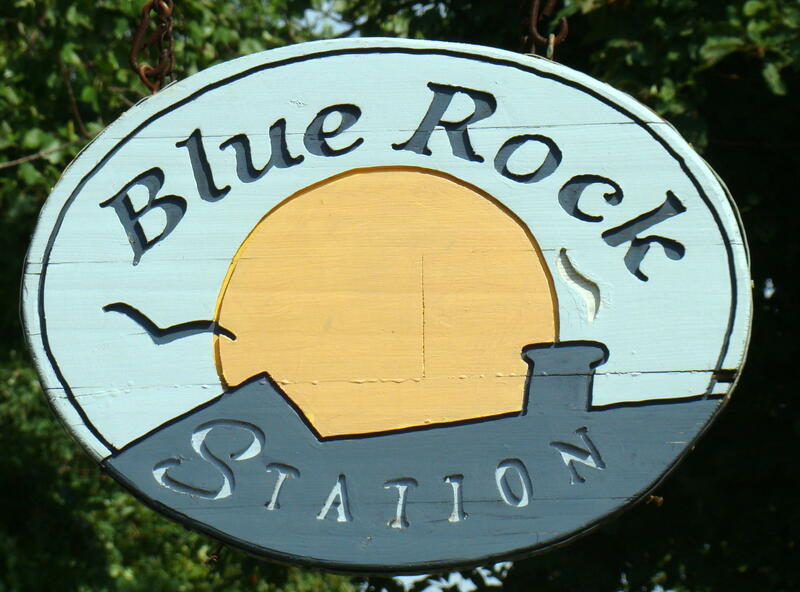 From then on, follow the Blue Rock Station signs until you reach the gate of the property. Chief Powhatan is memorialized here at the Point where the Captina Creek meets the Ohio River. The town laid out here in 1847 was named Powhatan Point in his honor. Captina Creek was the site of many Mingo, Powhatan, and Shawnee Indian camps in the late 1700’s, with exploration by famous white leaders such as Lewis Wetzel, George Washington and Ebenezer Zane. 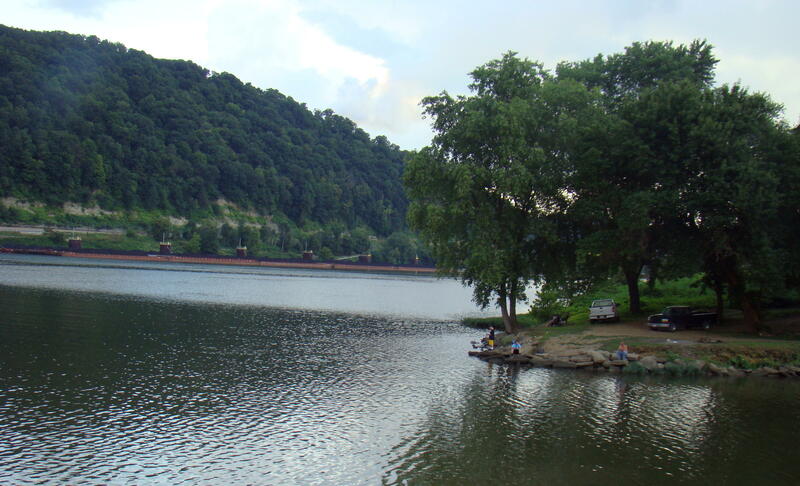 Today the banks of the beautiful Ohio River provide a peaceful place to watch the barges float by, or relax with a fishing pole in hand in the cool of the evening. When you enter town, an Ohio historical sign greets you. 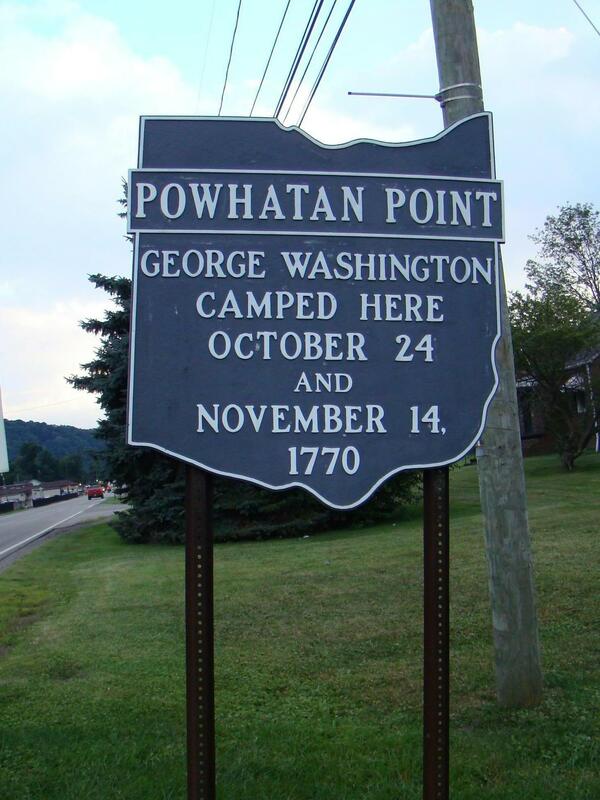 It states that George Washington camped at what is now known as Powhatan Point on October 24 and November 14, 1770. Some say that is the most important thing that ever happened in this small town, but there was more happening during the last visit. Chief Powhatan was famous for his dealing with the Whites, but even before the Europeans came to this section of America, he had conquered 30 different Indian tribes. Later Chief Powhatan, with the chiefs from those 30 tribes, tried to recover their lands, which they felt had been stolen by the English and European immigrants. 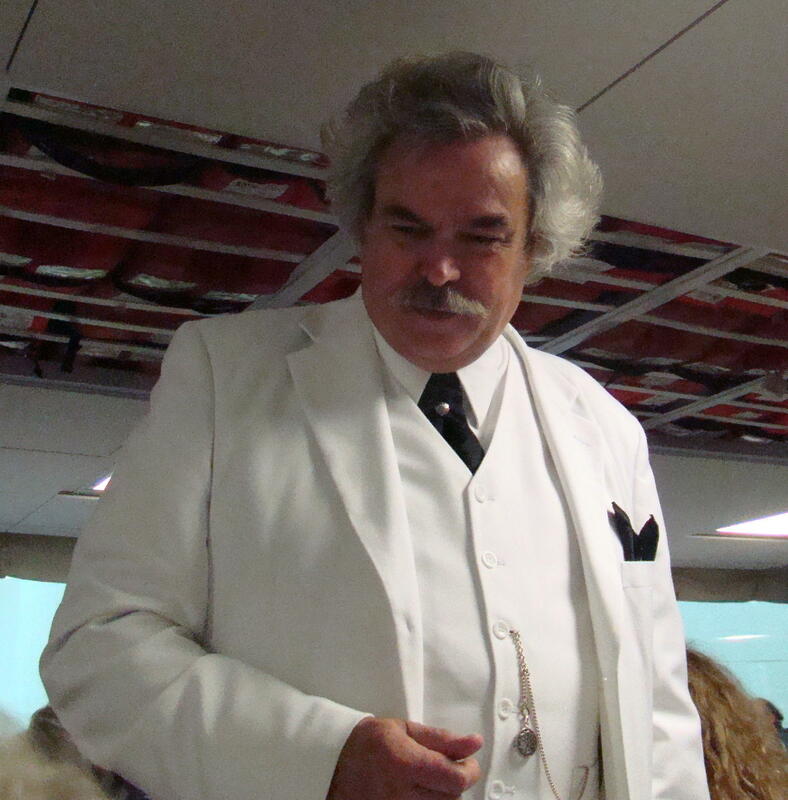 Since the town was named for Chief Powhatan, it seemed fitting for one West Virginia artist, Kandi Roche, to compose a modern day sculpture of the Chief for The Art Gallery at Powhatan Point Village. 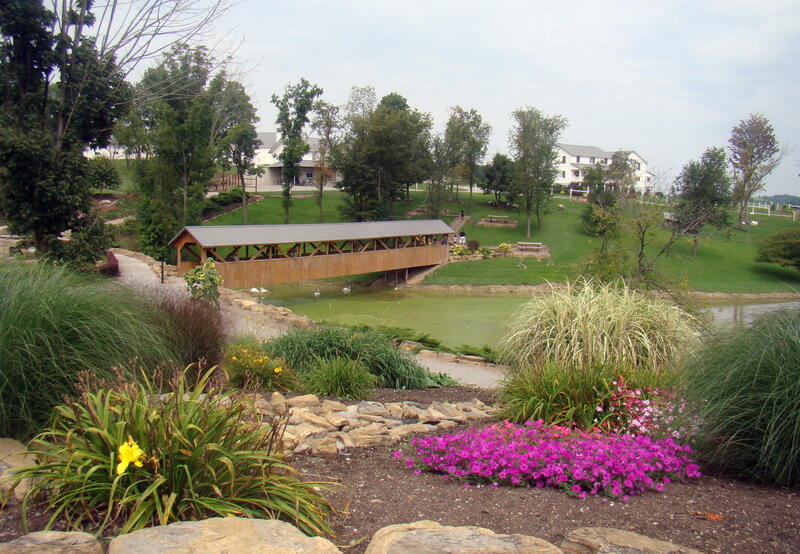 The art gallery is situated at what they call “The Gateway to the Appalachias”. 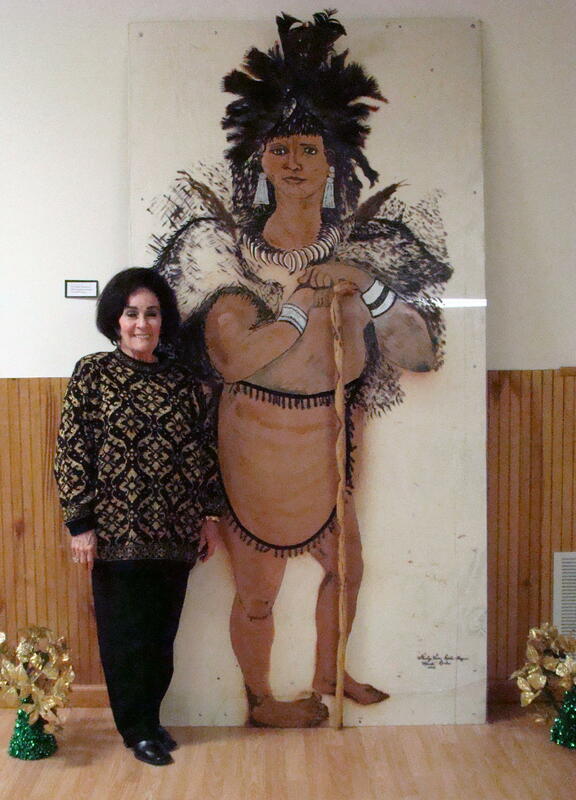 Kandi made an unusual Chief Powhatan statue, which was painted on plexi-glass, and left for the community to enjoy. This chief was the father of the famous Indian maiden, Pocahontas (1595-1617), who was a peacemaker to the first white settlers. A beautiful fence covered with Native American tribal patterns greets you when you arrive at The Gallery here. Inside are paintings, pottery, glass and photography. Art classes have been available from time to time. 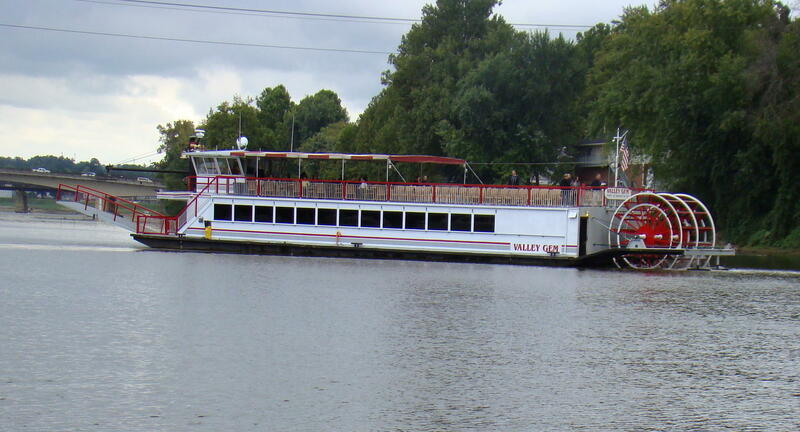 Since this is a relaxed atmosphere, little is scheduled, but friends enjoy getting together along the river banks. 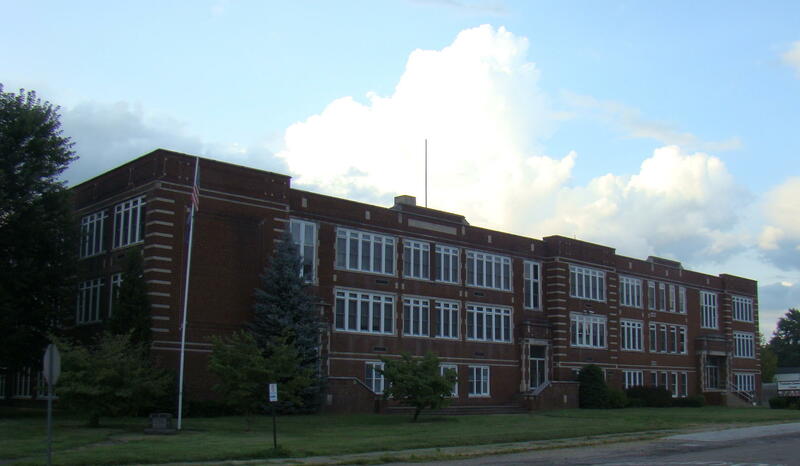 Just down the street from the gallery is the abandoned Powhatan Point High School, which today has been turned into a community center. During the month of December, Christmas in the Village is held here. 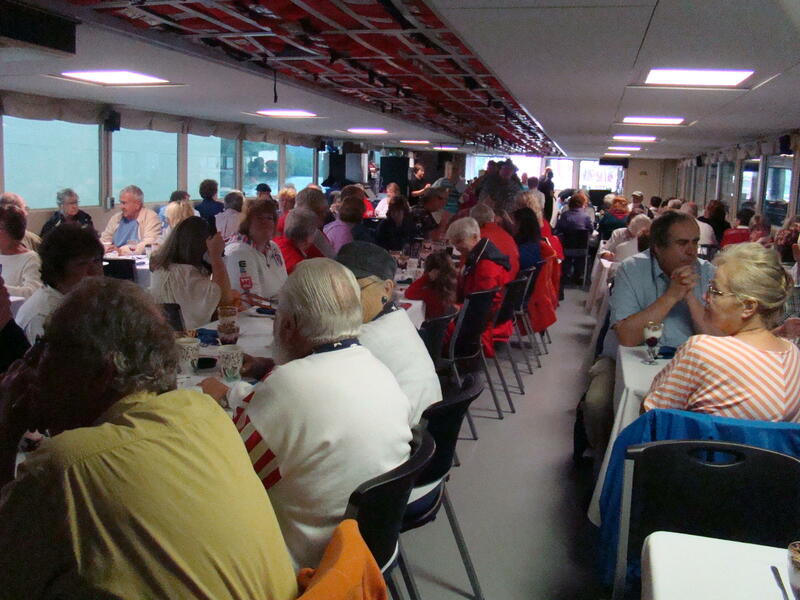 The 9th Annual celebration will be held in 2014 with crafts, food vendors, entertainment and of course, Santa. But if funds aren’t made available soon, this facility may be lost to the community. Kammer-Mitchell Power Plant across the river from Powhatan Point. Just south of Powhatan Point is the Kammer-Mitchell Power Plant providing electricity and employment for parts of Ohio and West Virginia. Today this American Electric Power (AEP) plant is partially shut down due to failure to meet EPA standards. They must convert their wet coal ash to a dry coal ash bed to return to full operation. 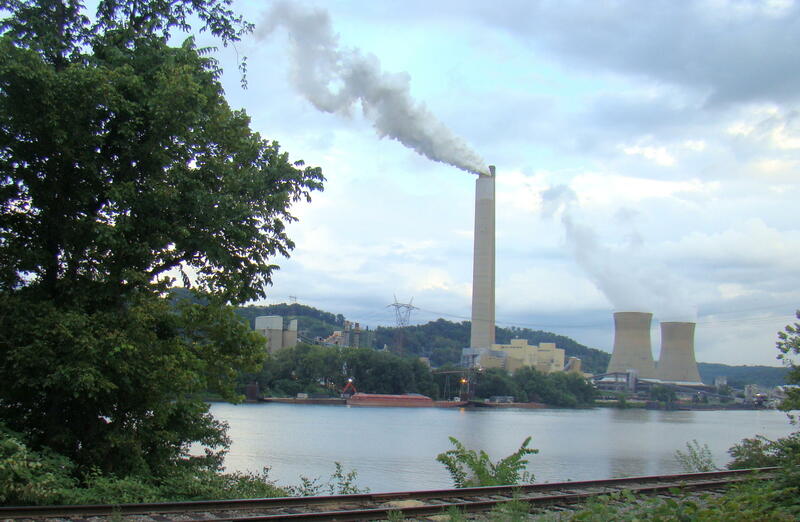 This coal-fired plant has the sixth highest power plant chimney in the world. 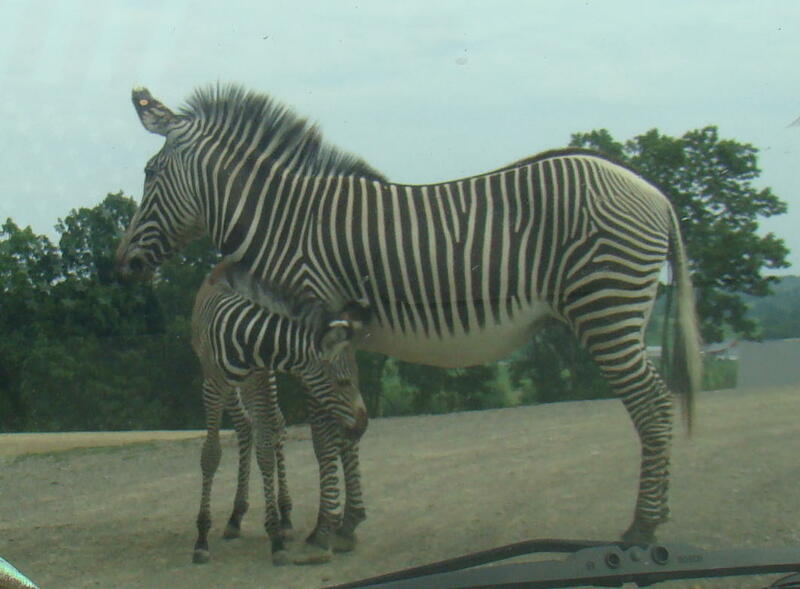 Drive through our beautiful land and watch for pieces of history wherever you happen to visit. Every small town has its place in history, and Powhatan Point is no exception. 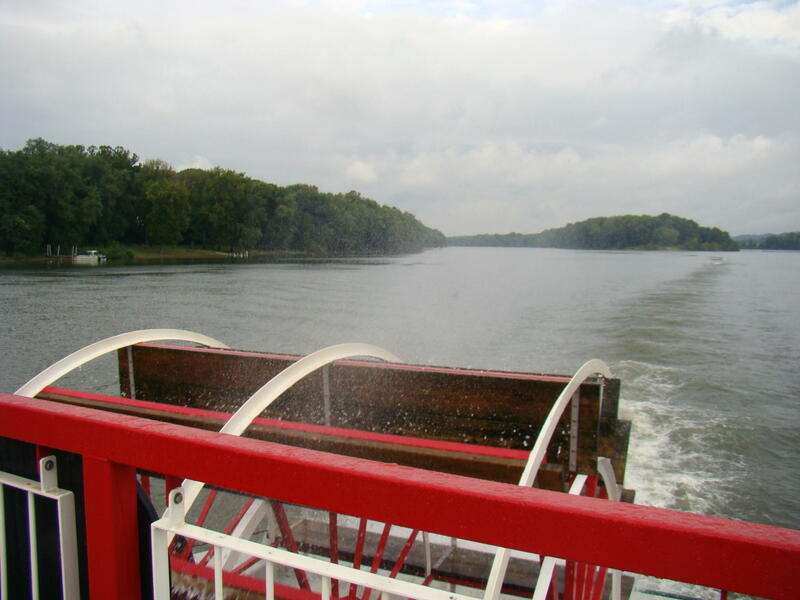 Drive along the beautiful Ohio River on Ohio Route 7 and you will come to the town of Powhatan Point, about fifteen miles south of Bridgeport, Ohio.